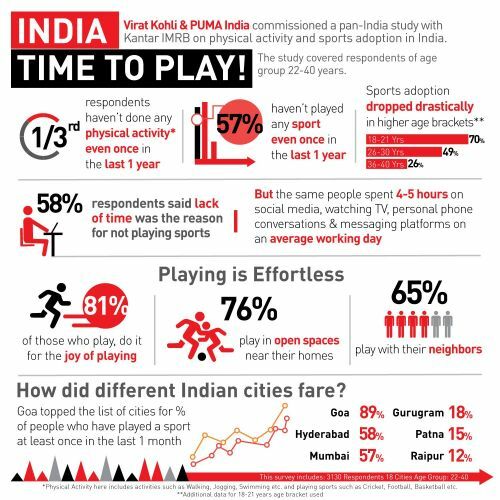 India’s leading athlete Virat Kohli and sportswear brand PUMA commissioned a pan-India study with market research agency Kantar IMRB to understand the current state of physical activity and sports adoption in the country. The study also assesses the barriers to playing sport regularly. Additionally, it highlights that the biggest motivation for adopting play is the sheer joy it brings and how it can effortlessly be included in everyday life. Physical activity here included any activity at home/outdoors/gyms/fitness centers such as Running/Walking/Zumba/Yoga/Swimming etc. as well as sports such as Cricket, Football, Badminton, Tennis, Table Tennis, Basketball, Volleyball, Hockey, Squash and local games such as Kabaddi, Kho-Kho etc. o While 70% of the respondents between 18-21 years had played a sport at least once in the last 1 year, this figure dropped drastically as individuals progressed in their occupations, and reduced to just 26% in the age bracket of 36-40 years. o However, the research brought out that the same respondents also spent close to 4-5 hours on social media, watching TV, personal phone conversations and usage of various messaging platforms on a typical working day (all put together). o 76% percent of those who play stated that they play in any open spaces that they find near their homes and 65% play with neighbours. Both clearly showing that lack of infrastructure or unavailability of people to play with were not barriers to play. o This was followed by Hyderabad and Mumbai. o Gurgaon, Raipur and Patna rated low on this index with only 18%, 15% and 12% of the respondents from these cities playing at least once in the last 1 month. 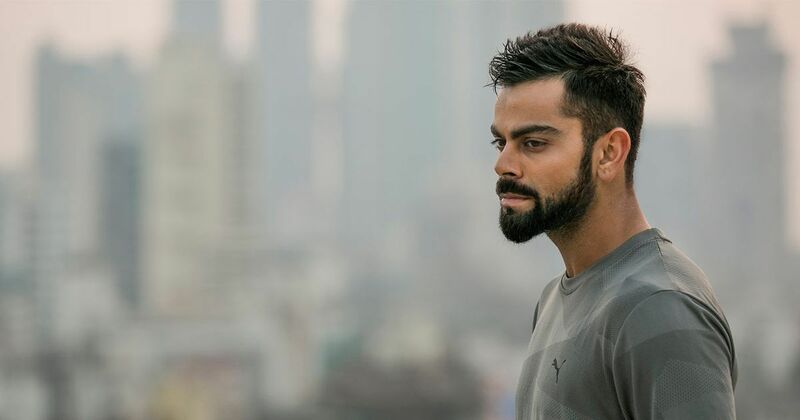 Responding to the findings Virat Kohli said, “It is shocking to see that one-third of the country has not done any kind of physical activity in the last one year. When you are physically fit, you are more energized to take on challenges. I have experienced this personally, and therefore strongly believe in leading an active lifestyle. The survey covered 3924 respondents from the age bracket of 18-40 years (both male and female). The respondents were spread across 18 cities - Bangalore, Mumbai, Delhi, Hyderabad, Chennai, Pune, Kolkata, Cochin, Ghaziabad, Goa, Gurugram, Guwahati, Jaipur, Lucknow, Ludhiana, Patna, Raipur, and Surat. Why Does Cheating Exist In Sports And Can Meditation Practices Help?